How have you identified the spider? There are a number of species which resemble Coelotes. What was the habitat? - where was the brick wall? i found a coelotes atropos while taking down a brick wall in central newcastle ne1.roughly 28mm long female, sadly no pics.is this spider becoming more prevailent in the north east ? We only have one modern record of Boreus hyemalis in Essex, from a small Sphagnum bog area in Epping Forest in winter. Yes, I agree your Pardosa is in the agrestis group, and monticola on very old or unimproved grassland is a good possibility. It will not be mature at this time of year, but this is a difficult group even with adults under a microscope and good lighting! Pardosa palustris is the only member of this group which is straightforward to identify (as an adult under a microscope). There is a lot of variation in epigynes and palps and reliance only on the figures of these is fraught with danger, and misidentification is not unusual. Locket & Millidge British Spiders is an essential aid. Voucher specimens of adults are absolutely essential for this group and anything at all unusual, improbable or unusual habitat etc should be checked by an experienced arachnologist. Even the most experienced arachnologist can have difficulties with some specimens. If I was forced to place a bet I would go for Stemonyphantes but that is just a bet! Pardosa it is. A stripey one like monticola but Peter could probably make a much better guess as he knows them very well. However he may pass on a guess! 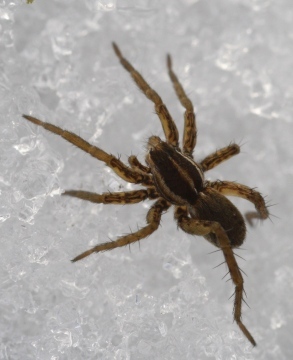 Why are you hunting spiders in the snow? It is never recommended in spider books! Thanks to you both for your help. I am only safe to call it Linyphiidae, then, from the sound of it! Just to help me get a rough idea of what I am looking at, can you confirm that this is a Pardosa for me...another one from snow, on open heath, today. I was only joking about the habitat!.....And of course Peter is absolutely correct the only definite ID is microscopical check of epigyne and palps. I would not be too sure this is Stemonyphantes. It could be a Bolyphantes. Needless to say it is not possible to be certain without an adult and in this case microscopical examination. Be aware that there is often variation in markings and pattern detail, not only between males and females but also between individuals and at various stages of maturity. This is not shown in figures in books, which can give a misleading impression. This is one reason that microscopical examination of adults is necessary for reliable identification of a large majority of spiders. Thanks for your confirmation. I assume you mean the snow as the wrong habitat (! )...beneath the snow is open, heathy, rabbit-grazed grass with rabbit holes, which is okay as a habitat, isn't it? Thanks for your help...just thinking about looking closer at spiders, so may post more as the year warms up. Certainly looks like it although the habitat is all wrong! 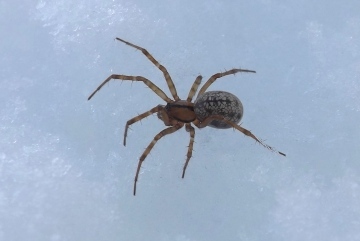 This spider was on the snow at a Yorkshire Wildlife Trust reserve this morning. Around 10mm with legs, at a guess. 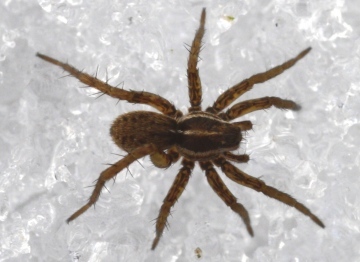 Is it Stemonyphantes lineatus, which it resembles a picture of in the Collins Spider guide? I think i may have found a steatoda nobilis near garstang in preston. I looks very much like all the pictures on google images, so i thought it may be one. however on this website, there seem to be none of these spiders above the midlands, and i am obviously up north! 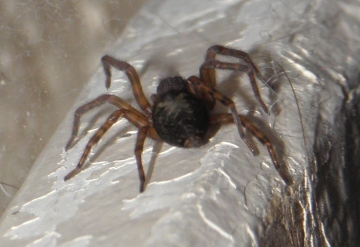 I only have two pictures of the spider, but would love it if somebody could identify it for me. thank you! I think Arctosa leopardus is a spider of seasonally wet habitats, which are usually restricted to small parts of an overall area. There is only one site I have ever found it in very large numbers, West Thurrock Marshes, in areas of saline seasonally (usually winter) wet habitat. Nice pictures, Peter, of this prettily marked spider. Arctosa leopardus is for me quite an enigmatic species and only ever find them in ones or twos. I have found them saltmarsh strandline debris and in dune slacks in West Wales. Most recently I found one on an East Sussex heath in a damp mossy area. I wonder if this species constructs a tube like other Arctosa species. That might explain why they do not jump out (at me at least) in Pardosa-like numbers. That agricola I just posted looks very like the amentata you just posted Peter. Ill remove it and double check my pictures! I recorded both species from the location!